6:00 PM - 9:00 PM Friday evening by the river! Stay Tuned Wind down your week with your favorite acoustic tunes! 4:00 PM - 7:00 PM Sunday by the river with Stay Tuned! Stay Tuned Check out the amazing views and great food while listening to your favorite acoustic tunes! 6:00 PM - 9:00 PM Back at Bonefish Willy's! Stay Tuned Winding down another week at one of our favorite riverside places! 4:00 pm - 7:00 pm RB Duo Sunday Funday Rich Brown Blues Our Duo back on the deck at Bonefish Willy’s! We love to play here! Come join us for tropical breezes, great food, drink and music! 6:00 pm - 9:00 pm Rich Brown Duo Rich Brown Blues Wow! Great views, food, libations! Our best music and the tropical breeze are free!! Come have some fun with us at this great venue!! 4:00 PM - 7:00 PM Back at Bonefish Willy's! Stay Tuned Join us for a kick-back Sunday by the river for your favorite acoustic tunes! 4:00 pm - 7:00 pm Rich Brown Duo Rich Brown Blues Thomas and I bring the best music we got every gig! Add great food, drinks and fantastic views and you got yourself a great time! 6:00 pm - 9:00 pm Rich Brown Duo Rich Brown Blues Our Duo brings the best music for you. Yes YOU! Stupendous views of the lagoon, tropical breezes keeping it cool on Saturday night! Join the fun, enjoy great food and drink and cut loose this weekend!! 6:00 PM - 9:00 PM Back at Bonefish Willy's! Stay Tuned Winding down your week by the river with your favorite acoustic tunes! 4:00 PM - 7:00 PM Sunday by the river with Stay Tuned! Stay Tuned Join us for your favorite acoustic tunes! 6:00 PM - 9:00 PM Back at Bonefish Willy's! 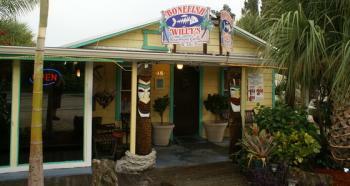 Stay Tuned A Saturday evening by the river - we love Bonefish WIlly's! 6:00 PM - 9:00 PM Back at Bonefish Willy's with Stay Tuned! Stay Tuned Catch us two evenings in a row at this great riverside restaurant! 6:00 PM - 9:00 PM Back at Bonefish Willy's! Stay Tuned Join us for a Friday evening by the river for your favorite acoustic tunes!